Having been involved in the training and supply of Personal Protection dogs for nearly two decades, my business which started as a hobby even in these times of recession is thankfully still thriving. The reason, I believe is that we sell based on quality, quality of the dogs that we train, quality of the training and quality of both the sales and after sales service that we offer our clients. Our clients then tell their friends and they in turn may buy dogs from us and again they tell their friends and so the word of mouth way of recommendation works and our client base grows. My reason for writing this blog, is that I am becoming increaingly concerned at the numbers of individuals and newly formed “companies” selling badly trained or even untrained dogs marketed as “Personal Protection Dogs,” “Family Protectors” “Elite Guardians”, just to name some of the terms used. Many of these vendors having simply jumped on the band wagon having perceived that it is an easy way to earn sizeable amounts of money by selling “trained” dogs. The truth of the matter is that it is not, at least if you elect to do the job properly and are buying in and training top quality animals and are caring for them appropriately whilst they are in your charge. Someone who just buys a dog and then re sells it is not a dog trainer but a dog dealer, unfortunately, many of the internet sites that are offering trained dogs for sale are not selling dogs that they have actually trained, they are merely importing sport dogs from Europe and then selling them as family protectors with little or no training in between. More to the point, as they only have these dogs for a matter of weeks they are unable to assess their character and temperaments properly. Reading this, you may ask well isn’t that what A1K9 does? The answer is No! At A1K9 we tend to purchase our young adult dogs mainly from breeders in Europe, with whom we have had working relationships with for years. Normally we will leave these dogs in Europe, where they will complete their preparatory training and conditioning and where they may be taken to schools and other environments which would be difficult to access with dogs in the UK. These dogs are often fostered out into family homes, where they get further acclimatised to children and become used to living in houses and participating in everyday family life. Only when they have reached a certain stage of their development both in terms of maturity and training are they brought to our purpose built facilities in Wales, where they complete their formal training and receive on going tuition until such time as they are placed with their new families. 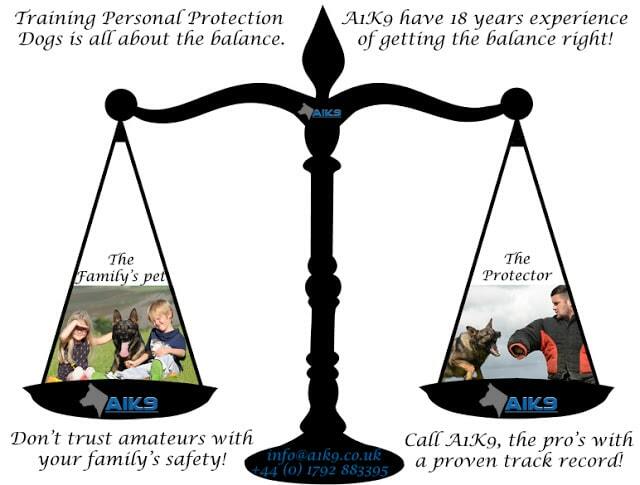 To give an indication of the time taken to train an A1K9 executive level dog, one would have work on an average of 14 to 18 months of structured training and conditioning, however this may be longer if the dog is not picked by a client. In Wales, our staff work 6 days per week and each dog is trained and or exercised on a daily basis no mean feat if you have 30 to 40 dogs at any one time! A week or so ago, I took a call from a gentleman who had visited two suppliers of “trained dogs” and he told me that he had been less than impressed by what he had seen and proceeded to ask about the different dogs that we had available. I spent about 20 minutes discussing his requirements and built up an idea as to which dogs I thought may best fit in and the conversation then turned to price. I quoted him on two of the dogs available, one at £10,000.00 and another at £14,000.00 and his response was one of disbelief. Apparently, one of the dogs he had been shown, was a fully trained dog of “police standard” that was priced at £4000.00, admittedly it wouldn’t sit when asked by its trainer and the gentleman was not allowed to approach it as it was “a bit sharp”, however, it was a “Police standard” dog and it was £4000 and why was mine so much more? The answer is simple and as I stated at the beginning of this blog, we train and supply based on quality. When we tell our dogs to sit, we expect them to do it, when one of our dogs needs to protect – it protects but when someone is properly introduced our dogs will accept them, hence our customers when meeting our dogs are encouraged to interact with them. How else can a person make a decision as to whether a dog is suitable for themselves and their family if they cannot approach it – common sense would tell me that it wasn’t. In short my belief is, one cannot expect to buy a dog that has had one and a half years of work put into it for a similar price to something that from the sound of it had maybe completed a couple of weeks training. As a non expert, how do you tell the good from the bad? The short answer is do your homework, check companies out, take up references, check out companies house. Satisfy yourself that you are dealing with a reputable company or person, especially if you have kids!! Remember when buying a family protection dog, that it is supposed to provide you with security and peace of mind and to be an integral part of your family. If you cannot trust it around your children, friends and family then it is a liability not an asset! A well balanced well schooled and social dog is a must in a family environment! A1K9 always has a selction of qualty dogs for clients to choose from and we adopt the same balanced and professional approach to pairing our trained protection dogs with their future owners and families as we do training our dogs. We do not cut corners! Ultimately if you are looking for a quality highly trained family companion that will protect as and when necessary then please feel free to call us at A1K9. We have a selection of around 30 dogs at any one time and we work on the ethos that we would rather not sell you a dog then sell you the wrong dog for you. We are open 7 days a week and welcome prospective clients to visit with their kids. around the longest and we have great customer loyalty and many clients who are pleased to recommend us. If you are considereing buying a personal protection dog and need some helpful advice, please do not hesitate to give me a call and I will try my best to help.